Debbie Aurelio and her family have lived in their Ewa Beach home for more than a decade, but they lost title to the house in a refinancing scam. 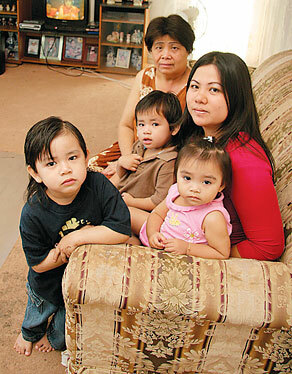 With her are two of her four sons, Carl Jovanie, left, and Carl Joris; mother Concepcion Fagaragan; and niece Jazlei Fernandez. Debbie Aurelio was waiting at the bus stop after work one day when a flier caught her eye, offering help to families facing foreclosure. She called right away. Her family had fallen behind on its mortgage payments after her mother got sick and had to stop working. Aurelio was desperately afraid of losing the Ewa Beach house she shared with her parents, her husband and her four sons -- the only home her kids have ever known. The plain, weathered home has a yard where the boys can horse around and a carport where the family shares meals with friends. Even the woman from the ad who promised to save them from foreclosure had come over. "We trusted her because she was really nice," said Aurelio, 33. "We thought she was working hard to help us keep our home, and we even invited her to have dinner with us a few times." More than a year later, the Aurelios discovered they had been swindled out of the four-bedroom house -- and $160,000 in equity they had built over a decade of home ownership. On her youngest son's first birthday, as they were preparing for a party, a sheriff turned up at the door with a court summons for eviction. "It was really horrible, the feeling," Aurelio said, her soft voice breaking. "It's hard to speak of it." Without their knowledge, the title to their home had been transferred. The monthly payments they had been making were not going to a new mortgage; they were going to a new owner. "We just thought we were doing a refinance," said Aurelio, who works in a microfilming office. "We had no idea it was being transferred or selling. It was a complete shock." The Aurelios are among an estimated 300,000 people in Hawaii who cannot afford a lawyer to help them with civil cases like fraud. The Constitution guarantees an attorney to people accused of crimes, but people who need legal help to protect their rights to their homes, their jobs and even their children are largely on their own. According to a recent report by the Access to Justice Hui, 77 percent of low- and moderate-income people in Hawaii do not get legal help when they need it. Those are families of four earning up to $47,000 a year, or 200 percent of the federal poverty guideline. The top legal issues they face involve housing, family law, domestic violence and consumer concerns. 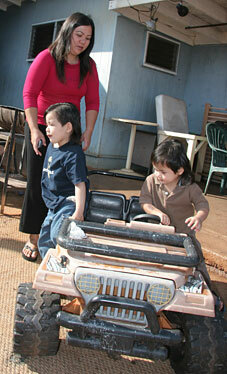 Debbie Aurelio and two of her four sons, Carl Jovanie, left, and Carl Joris, play in front of their home in Ewa Beach. She and her husband and parents have lived in this house for more than a decade, but the family fell victim to a mortgage rescue scam which ended up transferring title of their home to someone else while draining their equity. "When you face the loss of your house through foreclosure or improper eviction, when you face denial of public benefits, when you've been ripped off in some sort of consumer scam or where you're an abused, neglected child or a victim of domestic violence, those are critical civil legal needs," said Chuck Greenfield, executive director of the Legal Aid Society of Hawaii. "Our society is built with the concept of fair treatment and equal justice for all. When the 'all' only includes those who can afford a lawyer, that excludes many, many people in Hawaii. It tears at the fabric of our society." The lawyers Aurelio called wanted "a couple of thousand dollars upfront" -- money she did not have. A nonprofit group she approached was overwhelmed with cases and could not help for a month. Her last call was to the Legal Aid Society, which provides legal services to the needy. "I was so happy when they said they would help me," she said. The society has twice managed to stave off eviction. It is representing Aurelio and her relatives in a Circuit Court suit to reclaim title to their home, alleging deception, misrepresentation, fraud, conspiracy, negligence, unauthorized practice as a mortgage broker and violations of notary public law. "When somebody steals your wallet, you can get arrested and charged for theft," Greenfield said. "When somebody steals your house, it's not a criminal act. 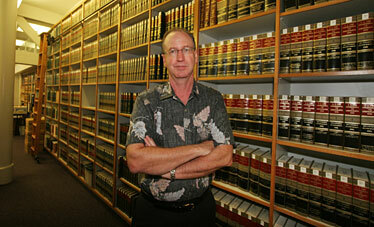 In Hawaii you have to locate an attorney and pursue your case in civil court." Chuck Greenfield, Legal Aid Society of Hawaii executive director, is a leader in the effort to help low-income people get the legal aid they need to protect their homes, their rights and their children. At this point Aurelio considers herself lucky, despite her ordeal. Demand for free legal services is so great that the Legal Aid Society and other providers in Hawaii have to turn away two out of three clients seeking help, according to the Access to Justice report. Funding for the federal Legal Services Corp., the main source of money for legal aid for the poor across the country, has dropped by half since 1980 when adjusted for inflation. In Hawaii, state funding for the Legal Aid Society of Hawaii is down to $810,000 in the current fiscal year, a 45 percent decrease from the $1.47 million it received in 1992. The nonprofit handles about 8,500 cases a year. Aurelio is nervous about going to court and what might happen to her family, which is still living in the house while the issue is litigated. Their house payments now go to a trust account. In a court deposition, she described how the woman from the mortgage company would stop by their home in the evenings with stacks of paper for them to sign. Often only the signature pages were showing. Once they met in an escrow office, and the woman borrowed their IDs to make copies of them. Aurelio does not recall signing anything in front of a notary, but documents transferring the home were somehow notarized. She and her family find it hard to fathom that it was all a sham. "It's not only us that she's doing it to," Aurelio said, wide-eyed. "How does she get away with it?"